JC’s excellent Imaginary Compilations series is one of the best ideas for a blog item I’ve come across. Following my Nick Cave contribution I got to thinking about numerous other compilations I could put together using the same rules – 10 songs over two sides of a vinyl LP that sound like it could be a properly coherent album. I don’t want to be greedy and take over this series with my stuff but my offer of a second piece has been kindly accepted. 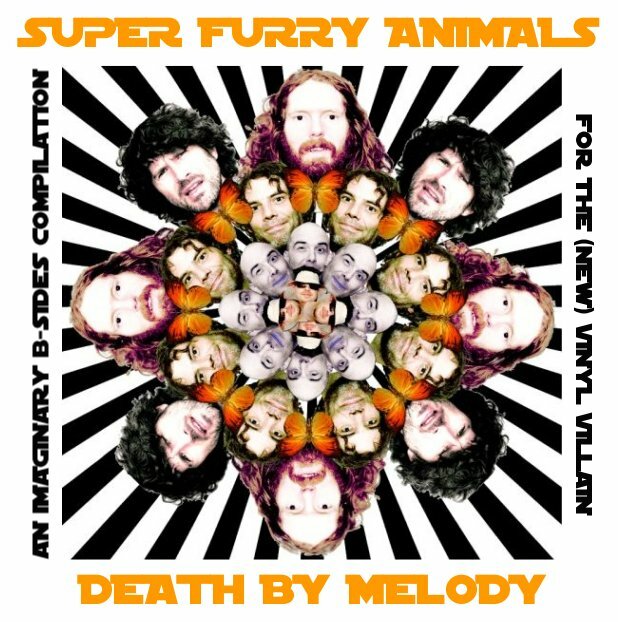 This time, I’ve decided to tackle the work of one of my faves, a band I had the immense pleasure of seeing recently – Super Furry Animals. Starting off with a song that could (should) soundtrack your summer. A cool funky reggae sound with a hazy psychedelic bent. It was the b-side of what was at the time my least favourite Furries single. While the a-side has grown on me over time, I was always a fan of Tradewinds. And this one has long been one of my all-time fave SFA songs. Quite why they buried it on the b-side of such an early single is beyond me. Not only should it have been on the debut album, it really ought to have been a single in its own right. It did appear on the 1998 compilation ‘Out-Spaced’, but even then it was tucked away in the middle of the record, so easily overlooked. Trans. : This Is (Not) The Song That Is Going To Save The Language. A typically lovely melody with an acoustic lilt, but offset with the buzzy guitar and slightly off-kilter key changes. Bowie circa Aladdin Sane could have written this. He’d have probably left out the Sasquatch though. Bit too strange for Dave, I reckon. Both b-sides of Juxtaposed With U are still better than the lead track. Another lazy, laid-back summer song, perhaps one for the evening this one. Sometimes it’s not the tune that makes the song, it’s everything else and the mood it creates. This is a great example of a song’s ambience taking centre stage while the melody drifts along in a low-key manner. The one where SFA sound like Man… Or Astroman? on steroids. Really rather rare, this one; Charge appeared on the b-side of the limited edition vinyl-only Ysbeidiau Heulog, the only single taken from the Welsh language album ‘Mwng’. It isn’t even included in this year’s deluxe reissue of said album. Shame – it’s a rip-roaring start to side-two. This one picked itself really. It’s a favourite of the band who are actually playing it in their current live set. Of course, it meant nowt to half the people at the Cardiff show I attended last month, but to the otherwise initiated it was a treat. One of my fave SFA singles had this little monkey hiding almost unnoticed on its flip. It reminds of so many other things that have come out much more recently, but as is the norm for the Furries, they seemed to be ahead of their time back in 2001. One of the biggest, most anthemic choruses they’ve done. An unashamed pop song that will lurk around your head for weeks, keeping you grinning like a fool. The one track here not sung by Gruff Rhys. Not sure who is singing here, but my guess it’s guitarist Huw Bunford. A little bit of Americana to finish things off and another delightful tune. It’s a nice contrast to its brooding A-side and remains one of the band’s maturest moments. I mean that in a good way – a cracking song. I know this isn’t in keeping with the true spirit of JC’s original 10-track vinyl LP concept, but think of it as, I don’t know, a limited edition bonus 7″. Or something. Either way, I couldn’t resist putting this final little gem on here. It’s a tender, heartfelt ballad that I think starts off sounding like Shangri-La by the Kinks. It rounds things off really nicely. The title, by the way, translates as Tremor In Your Voice. I’ve a few SFA singles in the collection and I knew five of the tracks selected by The Robster but what he’s done here is pull together what could be a cracking LP if released in that format. Here’s a taster for it with the opening track on side one which is, as he says, a song that should soundtrack your summer. Nice! I think all of these songs are new to me so looking forward to a listen! Thanks! This WILL go onto a cd for someone’s personal use! Utterly fabulous. This series is maintaining an incredibly high level of quality, but the b-side twist in this one is just inspired. I raise my hat to you. Well I would if I was wearing one. This is a really great compilation. I have most SFA music but one track I would seriously like is the radio edit of 2004 live version of The Man Don’t Give A F### (Live From London’s Hammersmith Apollo) which I believe was a promo CD single and 12″ promo.